In order to get an even more concrete idea of our work, we document selected projects in short case studies. The current references can be found in the following list. For the PDF download please click on the corresponding link. Since we update this reference library on an ongoing basis, it is worthwhile to have a regular schedule. Please note: Currently, most case studies are unfortunately only available in German on our German website. 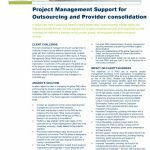 In scope of the client’s outsourcing initiative is Global Middle Office, Fund Accounting, Transfer Agency and Depositary/Custody Services. The key objectives are to reduce complexity and costs of the fragmented provider landscape and implement a preferred service provider, globally, including global processes and agreed services.